This is the 2nd part of the gameplay tutorial series focused on turn based grid battles – you can find part 1 here. In this part we’ll set up the battle grid in the field scene, battle start/end events for grid battles, as well as a battle using the grid. We’ll be working on the 2 Field scene in this tutorial, which is already pretty clustered with things from the game tutorial series at this point. I’ll remove all unneeded things from the scene, i.e. all battles and battle areas, item collectors and the introduction event (including the cam points). In case you’re doing the same, you can keep a backup of your scene by saving it using a different name (File > Save Scene As…). I’m assuming you’re also working with a cleaned up scene for the rest of the tutorial, i.e. only leaving the areas, music player, scene changer and spawn point from the previous tutorials. First, we’ll need to find a nice place for our battle grid in the 2 Field scene (can be found in Assets/Tutorial Resources/Scenes). I’ll place my grid at the northern fork of the forrest path – use the ORK scene wizard to create a new Battle Grid (Create Object > Battle Grid) and place it somewhere around X=137, Y=2, Z=370. Using the scene wizard we’ve got a new game object with a Battle Grid component attached. We’ll use it to create a 10×10 grid at this position, change the following settings in the component’s inspector. The Cell Settings define the grid cell types that will be used when generating the grid. The Raycast Settings define the raycast that is used to place the individual cells on the ground. If the raycast didn’t hit anything, the empty cell type is used, otherwise the grid cell type, unless the ground’s slope is above 45 degrees – in which case it’ll use the blocked cell type. 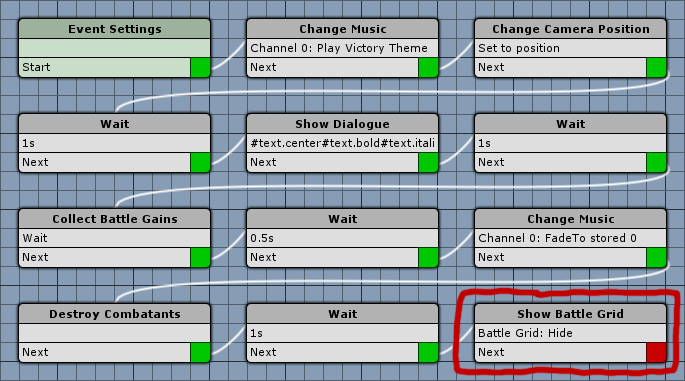 By default, battle grid cells are not displayed in the editor. You have to change the following settings in the Grid Setup to see the individual grid cells. If enabled, the grid would automatically be displayed in the game when the scene loads. Since we also walk around in the scene, we only want to display it during battles – this will be handled by the battle start/end events. 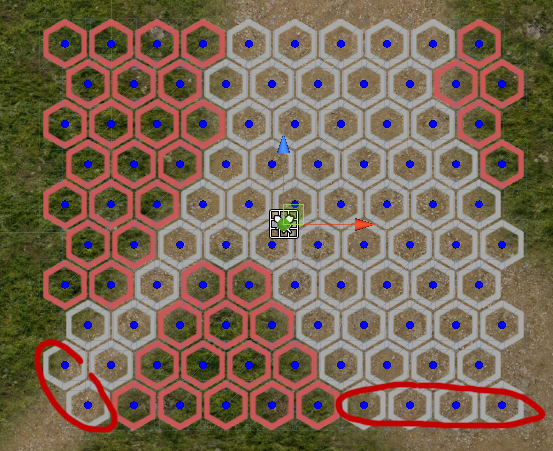 Since the ground is pretty even, we don’t have any blocked cells here from the grid generation – let’s change that by painting some blocked cells on the grid. To do this, select the Paint mode in the Grid Setup and select the grid cell type you want to paint. 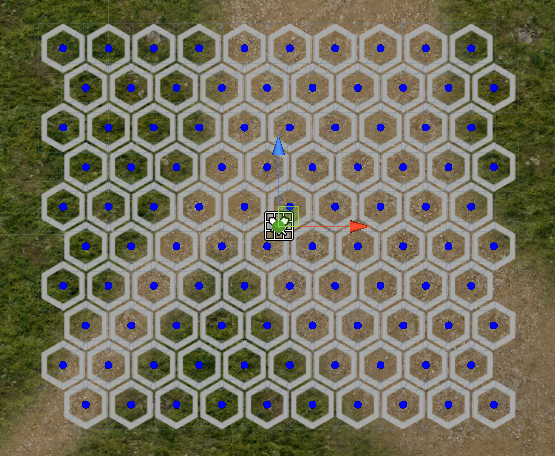 We only need to set some deployment cells for the player and enemies to finish our grid. Let’s start with the player deployment cells. And finally we’ll set some enemy deployment cells. That’s it for the battle grid – don’t forget to save the scene. Our battle grid is set to be hidden during the game, i.e. we need to make it visible in the battle start event, as well as trigger the player combatant placement. But first, we’ll set up a new Camera Position for the battle. Open the ORK Framework editor and navigate to World > Camera Positions, add a new camera position and change the following settings. Set to Grid Battle View. Set to X=-15, Y=20, Z=5. Set to X=5, Y=0, Z=0. Disable the other ignore settings. That’s it for the camera position – next we’ll create a new battle start event. This event is also included in the Grid Prefabs, in case you don’t want to set it up yourself. First, we’ll store the currently playing music. Since we only use one music channel and only want to store one clip, the default settings are enough here. This is a crucial step in grid battles – in order to see the grid and be able to move/act on it, it needs to be displayed. Since our player (or the whole group) is already spawned in the scene, we need to destroy them. Otherwise the player/group would be standing around on the grid during the player combatant placement. And that’s it for the battle start event – click on Save Event to save it, e.g. as gridBattleStart. For our battle end events, we only need to replace the victory and escape events – and we can build upon the already created battle end events from the game tutorials. All we need to do is add a Show Battle Grid step to hide the grid after the battle. We don’t need to replace the defeat event, since this will result in a game over and load the game over scene anyway, so there’s no need to hide the grid. Add this step at the position it’s marked in the images. Open the simpleVictory battle end event that was created during the gameplay tutorials and add a Show Battle Grid step, set up as described above. Since we may want to keep the old event around as well, click on Save Event As and save the event e.g. as gridVictoryBattleEnd. Open the simpleEscape battle end event that was created during the gameplay tutorials and add a Show Battle Grid step, set up as described above. This time, we’ll add it before the last Fade Screen step. Since we may want to keep the old event around as well, click on Save Event As and save the event e.g. as gridEscapeBattleEnd. Next, we’ll set up a battle that will use the grid and battle start/end events we just created. 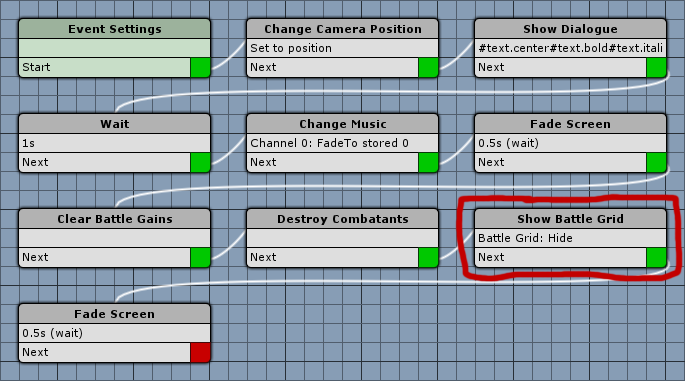 Use the ORK scene wizard to add a turn based battle to the scene (Create Object > Battle > Turn Based Battle) and place it at the position of the grid. This is basically the same as any other battle we’ve set up so far – change the following settings of the Battle component. This should be set to 0 if there is no other battle in the scene. Otherwise it’ll have an automatically assigned scene ID, or you can click on Get New Scene ID to obtain one. This will automatically use the battle grid that is closest to the battle’s game object. We’ll override the default battle start/end events here. Alternatively, you can also just replace the default events in Battle System > Turn Based Battles. The next grid battles tutorial will handle grid movement and ranges.